Weather gadgets are always the perfect gift for my dad! 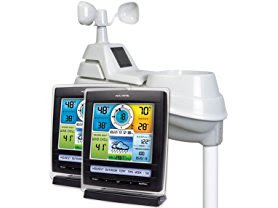 Right now this AcuRite Pro Color Weather Station with 2 Displays is only $125.99 (Reg. $199.99)! The AcuRite Pro 5-in-1 Weather Station includes a 5-in-1 weather sensor, and two (2) color weather station displays for 5-in-1 sensor data. Measure temperature, humidity, rain, wind speed and wind direction right in your own backyard. Dual digital displays allow you to observe your weather data in multiple rooms. The illuminated color displays feature three different lighting settings, ensuring you can easily read the information you want at a glance. Select a lighting preference manually, or choose auto dim mode. In auto dim mode, the display automatically adjusts its brightness based on time of day and year. The high-precision 5-in-1 weather sensor accurately measures five different conditions, including rainfall, wind speed and wind direction, outdoor temperature and humidity, giving you comprehensive data about the elements surrounding your home.